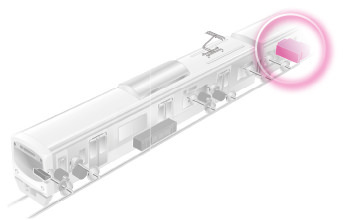 Auxiliary power supply｜Transportation Systems Products｜Transportation Systems｜Products Information｜Toyo Denki Seizo K.K. The auxiliary power supply (static inverter) converts the power for interior light, displays, air conditioning, etc. Even though there is a propulsion inverter, the static inverter is installed in order to supply power that has low voltage and constant frequency. The propulsion inverter provides for smooth ride comfort while the static inverter provides for interior comfort. High reliability, compact, lightweight: This is a high-frequency, pulse width modulation (PWM) inverter with a reduced number of components. High efficiency: Direct conversion using single-step conversion of input power to output power. Improved maintenance efficiency: Comes standard with a device monitor to provide for self-diagnostics to help pinpoint the location of failures. Standby redundant system operation: All the major points in the control circuit, from the input breaker to the inverter, are redundant, making it possible to switch systems in the event of a failure.